Trexus product offers good value and good quality. This is our entry-level office product that enables you to equip an office at a great price. Trexus includes a range of stylish seating that will give your office a fresh and different look. The models are available in various colour fabrics and leathers. The range includes operator chairs, stacking chairs, cantilever chairs, managers & task chairs. Most of the seating has moulded foam giving extra support and comfort. These chairs go to a max weight of 114kg / up to 18 stone. Range also includes chairs that are heavy duty and suitable for 24 hour use. The Heavy duty chairs go up to 150kg / 23 stone. All are fire retardant in accordance with BS7176. Trexus office incorporates everything for the small or home office. Features on this product are 18mm desktop, various desk shapes, solid end panels and 1mm edging. Trexus is designed to fit into an office environment. The desking is 18mm thick with a metal under frame to support the desk. Desk legs come in different options. Edging is 2mm thick. Desk comes with two wire management ports. 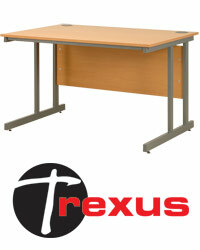 Trexus Plus is a sturdy product that has a 25mm thick desk top. Desk legs come in different options. Desk edging is 2mm thick. Desk comes with two wire management ports. Trexus Accessories means that you can fit out your office with pedestals, tables, bookcases, filling cabinets etc. There are a large range of stylish accessories that integrate together to give one great look.